Are you a huge fan of hoisin sauce? If you’ve ever eaten Peking Duck or Moo Shu Pork, it’s that delicious dark sauce that gets painted onto the pancakes. I’ve always been a big fan–Frank and I often make pork roasts smothered in some mix of hoisin and whatever looks Asian in the fridge. 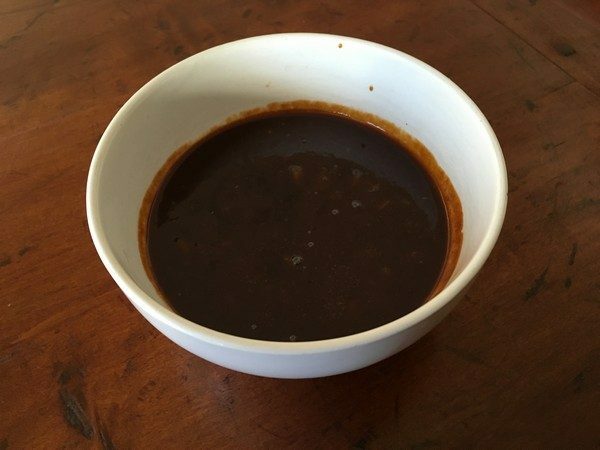 So when bon appétit ran this recipe for pork chops with hoisin sauce that you make yourself, I was skeptical at first—why make it when the stuff in the jar is just delicious? But then I saw how easy it was and became interested. Heat oil in a medium saucepan over medium. Cook garlic, stirring often, until golden brown, about 2 minutes. Add soy sauce, honey, vinegar, tahini, and Sriracha and whisk until smooth. Cook, whisking occasionally, until mixture is thick and smooth, about 5 minutes. Taste and season with salt and pepper and let it cool. The sauce will keep about 4 days, covered, in the refrigerator (if you don’t eat it all first). I used half the hoisin to marinate the pork chops overnight, but if you’re impatient, you can do them for as little as an hour. 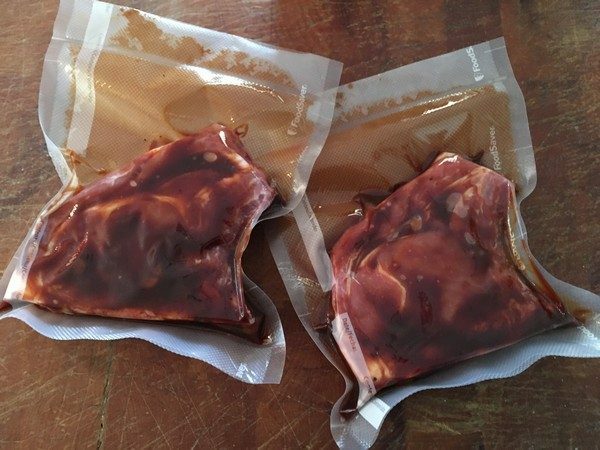 The way I’ve been cooking pork chops recently is really simple, it just requires “standing over a hot stove” but you can catch up on email etc… Click here for the recipe. My verdict: We were both really surprised at the addition of tahini which I’ve never thought of as Chinese, but hey, they travelled. This was really good and the hardest part was coaxing the honey from the container. They just don’t make those bears like they used to! I’m about to make another batch to coat a pork loin that will get roasted (unless the weather warms up and we can grill). I forgot to do a taste test with our old standby, but there will be other chances. What do you think the results will be? 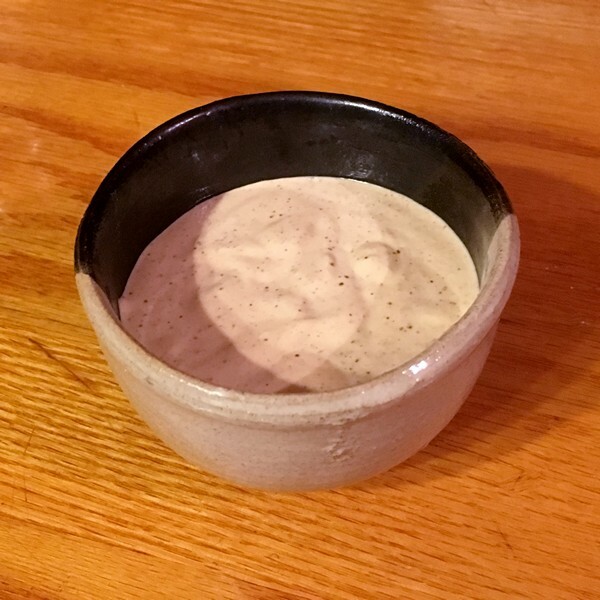 This magic sauce came about when I was looking at Tracey Medeiros’ The Vermont Non-GMO Cookbook recently. 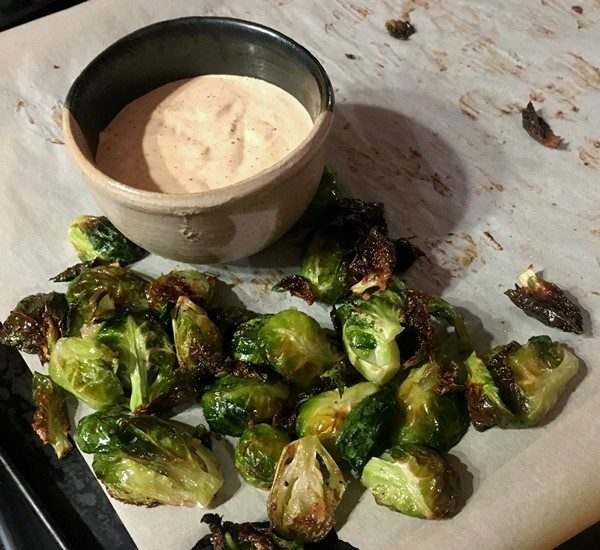 Her Brussels Sprouts with a Creamy Sriracha Dipping Sauce was one of the recipes that jumped out at me! Preheat the oven to 400°. 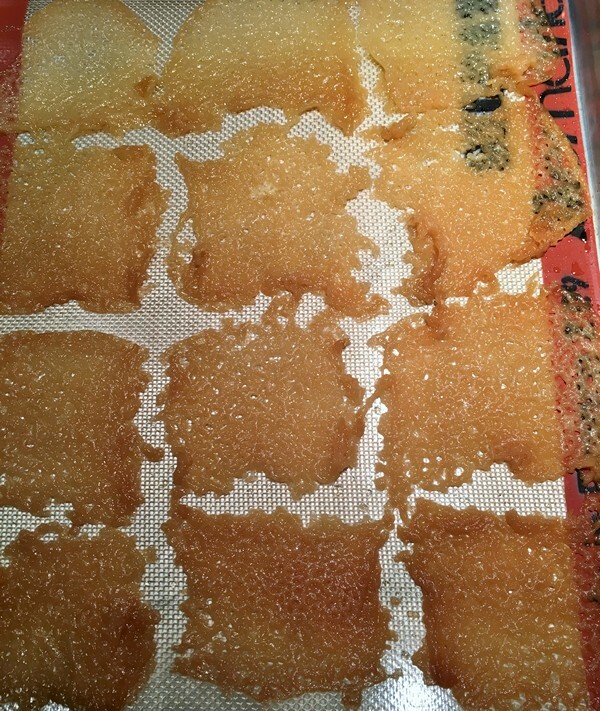 Lightly grease or cover a baking sheet with parchment paper and set aside. 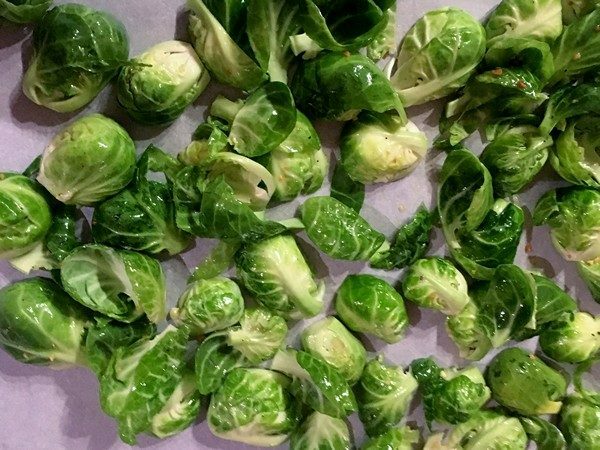 In a medium bowl, combine the Brussels sprouts, garlic, oil, salt and pepper. Toss to combine. Put the sprouts on the baking sheet cut side down and bake for about 20 minutes until they’re golden brown. While the Brussels sprouts are cooking, make the sauce. Stir all the ingredients together until well combined. Serve the Brussels sprouts with the Sriracha sauce on the side and enjoy! My Verdict: It took a while to actually getting around to trying this, because one day we had a lot of sprouts, but no mayo. Then I made mayo, but we’d eaten all the sprouts. Finally, I got it all together we loved it! I used olive oil on the sprouts, instead of coconut oil and they were fine. I might try coconut oil the next time, just to see what happens. For the garlic powder, I used my new fave from Rockerbox Spice Company. 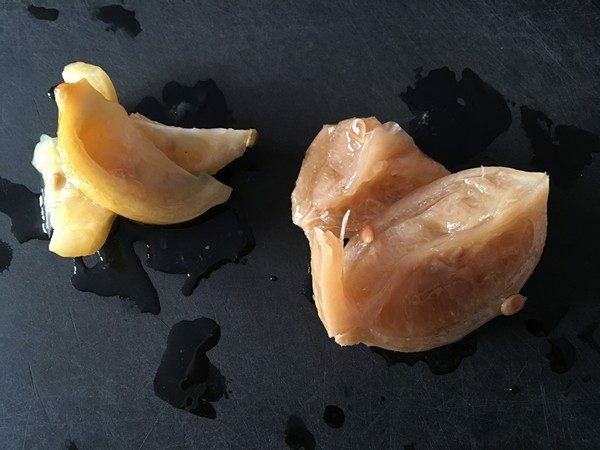 It’s pure dehydrated garlic and really makes a difference! After tasting the sauce, I added more Sriracha and horseradish to give it more of a kick. Little did I know that Frank made the sauce his go-to for every sandwich he’s made since then. We think it’s going to be great on burgers—just haven’t done that yet. And don’t tell anyone, but it’s terrific as a dip for potato chips. Try it and let me know what you think. Brussels sprouts optional. 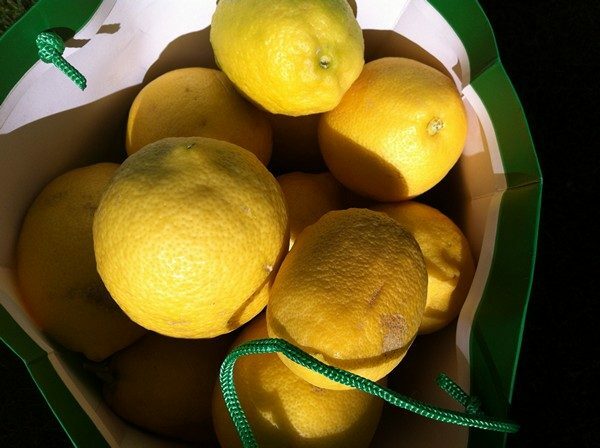 After making the lamb and quince tagine, the Accidental Locavore still had a few quince rolling around the kitchen. This chutney looked like an interesting way to put them to good use and I happened to have all the ingredients on hand – always an incentive! Heat the oil in a deep, non-reactive (stainless steel or enamel) pot over medium heat. Add the shallot and garlic and cook, stirring frequently, until shallots are translucent. Add remaining ingredients to the saucepan and bring to a boil. Reduce heat to low and simmer, uncovered, stirring occasionally, for about an hour or until the consistency is thick and jammy. Serve chutney at room temperature and enjoy! My verdict: Delicious! This was a lovely accompaniment to a variety of cheeses (not that good cheese really needs it) we had at a friend’s house. It was also great with some roast pork we had for the holidays. 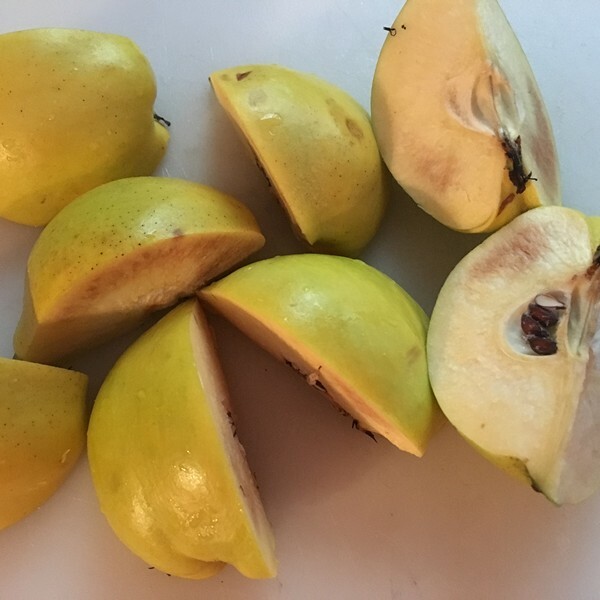 Prepping the quince is a lot like prepping apples and they tend to turn brown like apples, but it doesn’t matter since they’re going to be cooked down. If you don’t have dried cherries, try dried cranberries, or a mix. If you like raisins, they would probably work well too. My chutney took about 90 minutes to become what looked like “jammy” to me. However, when it cooled down it got much thicker. Depending on how thick you want the end product to be, cook it for 60-90 minutes on low heat. 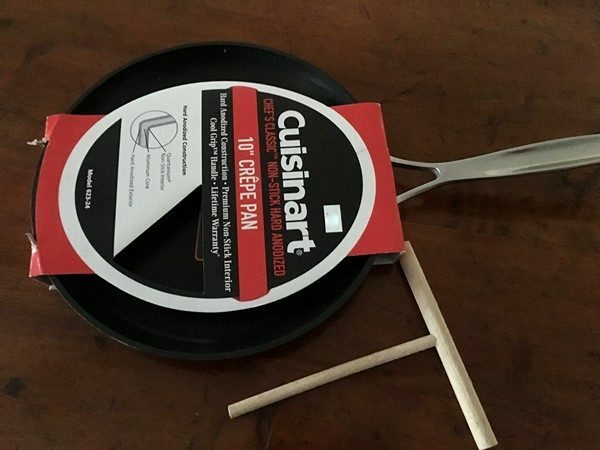 I used a non-stick pan which made cleaning up easy. 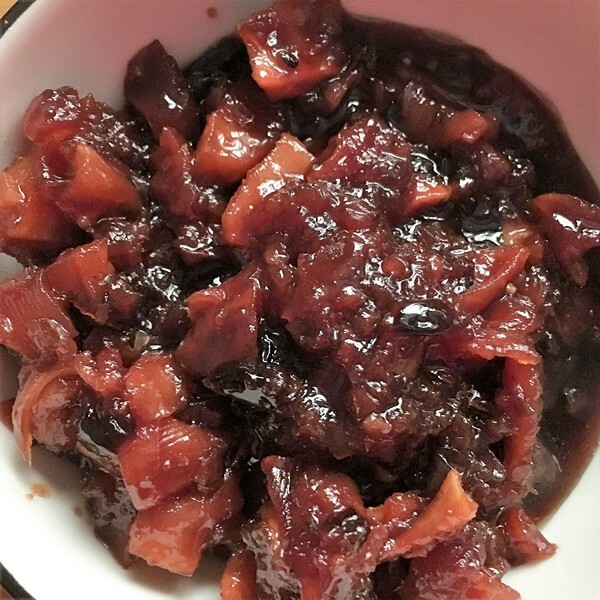 This apple relish came last year when I was playing golf with friends, it’s simple and a nice way to use up a couple of apples. In a medium sized pot over medium heat, heat the sugar and vinegar, stirring to dissolve. 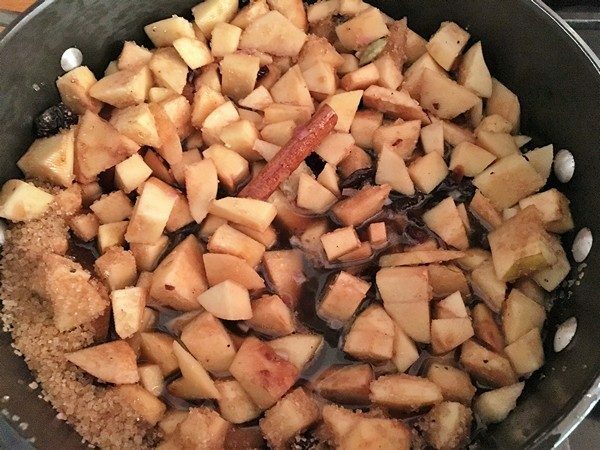 Stir in the apples and cook for about 5 minutes, until the apples are cooked but still hold their shape. Stir in the ginger, taste and add salt as needed. Cool to room temperature. Serve and enjoy! My verdict: Although I’m not generally a fan of “stuff” other than bread or a plain cracker with cheese, this was a nice addition. 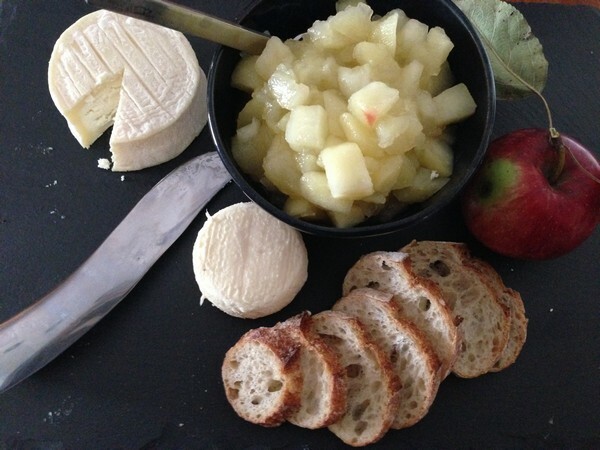 The apples had a nice fresh flavor that contrasted well with the rich funkiness of the cheeses. Leaving them in chunks kept them from turning into mush (aka apple sauce). The ginger added a hint of spice and some brightness. Now that I’ve done my posts for the Goat Cheeses of France, I can sit back, relax and enjoy their wonderful chèvres my way, with a baguette. The rest of the relish I’ll use to garnish a duck, or go more traditional with some pork chops or smoked pork tenderloin. What would you use it with? 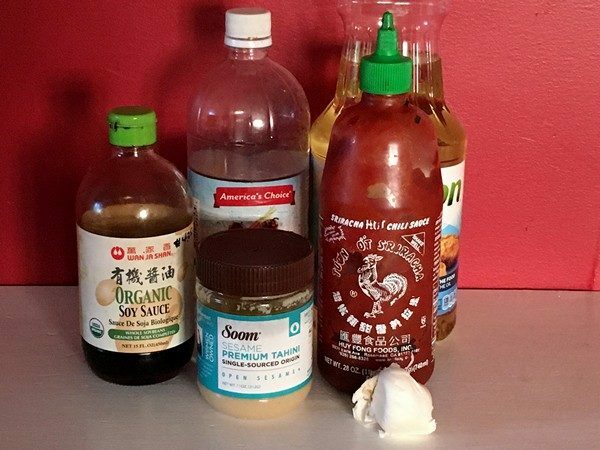 Thai sweet chili sauce may not be one of the condiments you reach for, but that could change quickly. It’s really versatile and goes well with everything from fish to French fries. The Accidental Locavore’s husband, Frank, first fell in love with it at the Oakhurst Diner in Millerton and promptly ordered a couple of bottles. One evening we were desperately scraping the last bits out of the bottle. 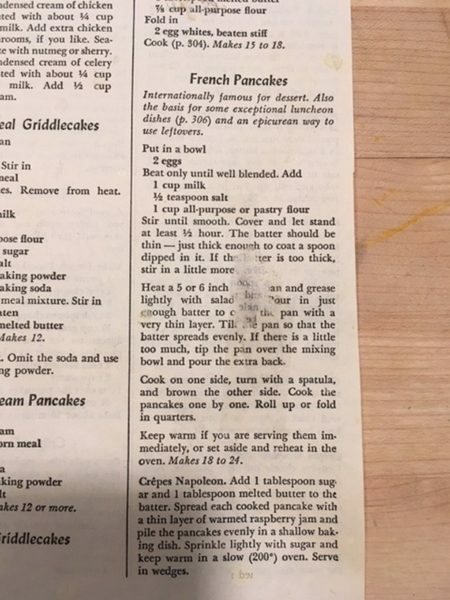 There had to be a recipe online. 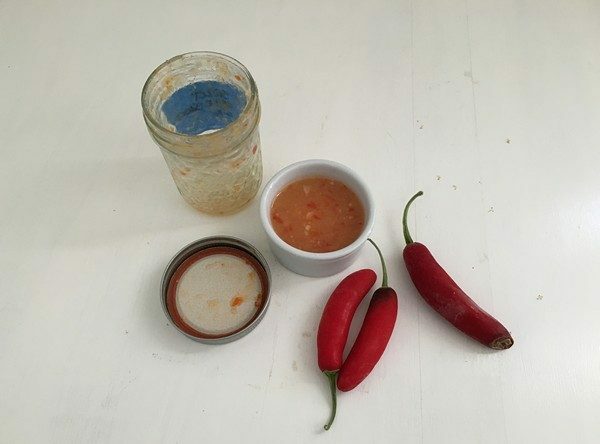 There was, and now Thai sweet chili sauce is always in our fridge. Quick and easy, this makes about a cup. 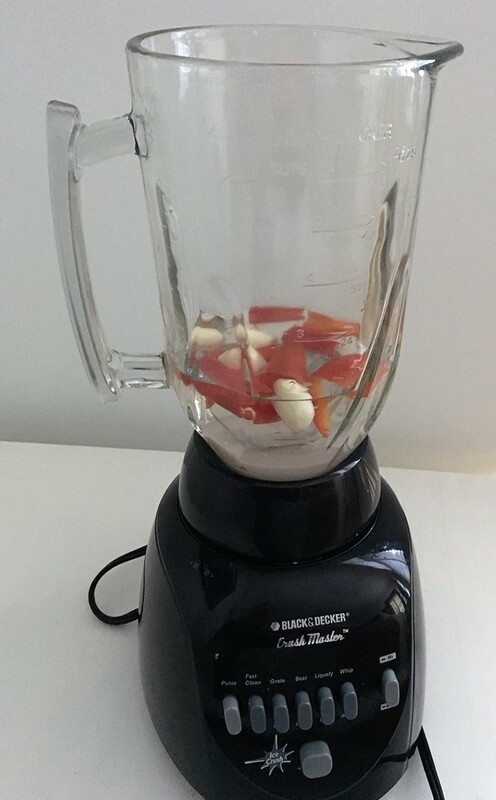 In a blender, purée the garlic, chiles, vinegar, sugar, salt and water. Transfer the mixture to a saucepan and bring to a boil over medium-high heat. Lower the heat to medium and simmer until the mixture thickens up a bit and the garlic-pepper bits begin to soften, about 3 minutes. In a small bowl or cup, mix the cornstarch and water to make a slurry. Whisk in the cornstarch mixture and continue to simmer until the sauce starts to thicken slightly (and causes a nice suspension of the garlic-pepper bits). 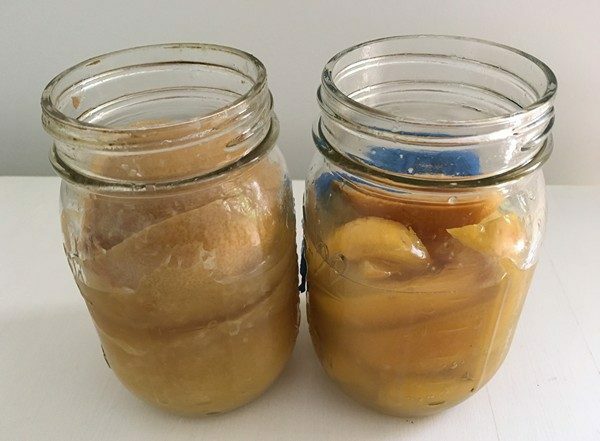 Let cool completely before storing in a glass jar. Serve and enjoy! My verdict: Another thing we’ll never buy again! It’s probably better made with a blender, but if all you have is a food processor, that will work too. This version was a little hotter than the bottled one (we did save a bit for comparison), but it really mellows after a couple of days in the fridge. 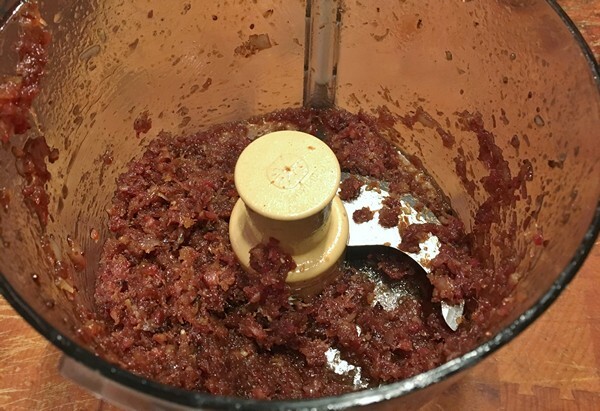 If you’re worried about the heat, finely chop all the chiles, throw a little bit in the blender and add more until it gets to your desired heat level. 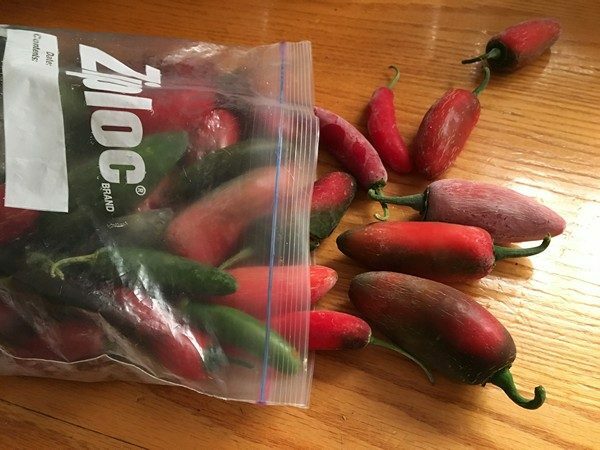 A lot will depend on the chiles you have (and if all you have are green ones, that’s fine, it might just look a little weird). Store the chili sauce in the refrigerator and let us know in the comments what your favorite use for it is. If I’m a cook, that’s what I do. Doesn’t matter—humans or canines. What really spurred this on was a recipe for these cookies on BarkPost and a very ripe banana that was on its way into the garbage. They’re really simple, you probably have everything on hand, and just remember, unlike humans, a dog is never going to complain about a cookie. 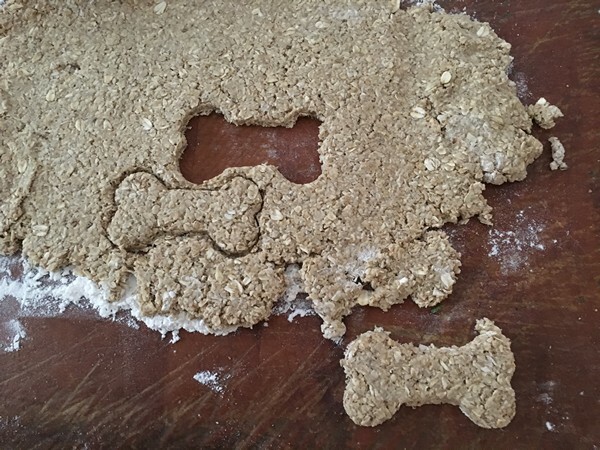 Makes about 20 3” bone-shaped dog biscuits. Preheat the oven to 350°. Line a sheet pan with parchment paper and set aside. In a blender or food processor (blender is preferable), blend the oats until you have a fine powder. In a medium bowl, add the oatmeal flour, coconut oil, cinnamon, honey, and banana. Mix until well combined into a stiff dough. If the dough is too stiff, add a little water. Or, if it’s too sticky add a little flour. Bake for about 25 minutes until golden brown. Cool, treat and enjoy! 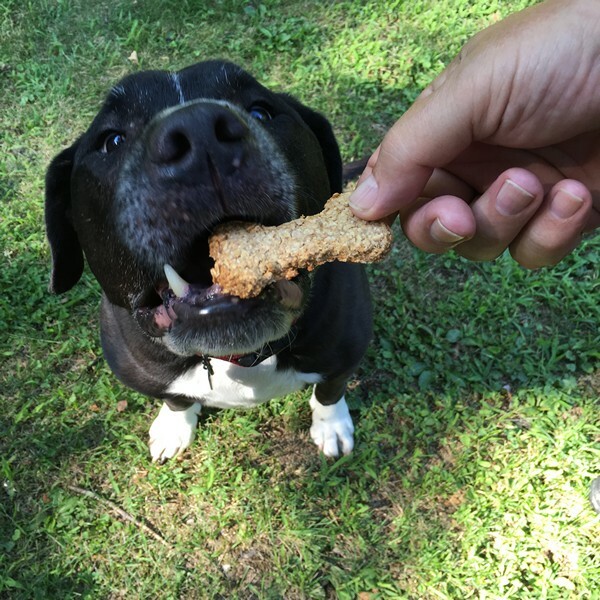 Rif’s verdict: Woof, woof! Much better than those healthy dehydrated sweet potatoes (don’t tell him these are healthy too!). I’ll sit for one of these anytime! Frank’s verdict: “Are these for the dog?” Maybe the bone shape gave it away. He thought they needed salt, something he rarely says. 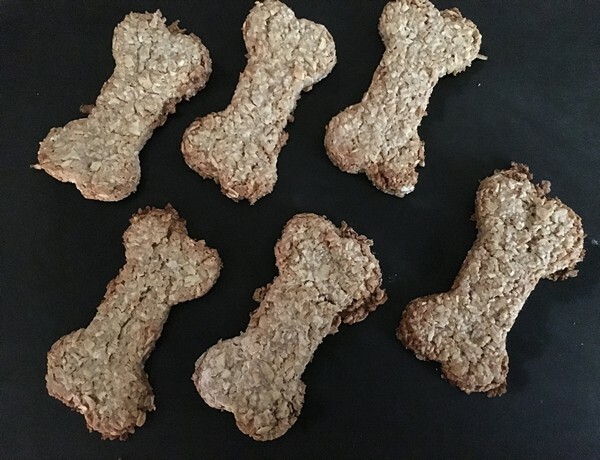 My dog biscuits looked coarser than the BarkPost ones, probably should have run the oats through a blender rather than the Cuisinart, but I was multi-tasking. If your dog is like mine, you might want to make a double batch. 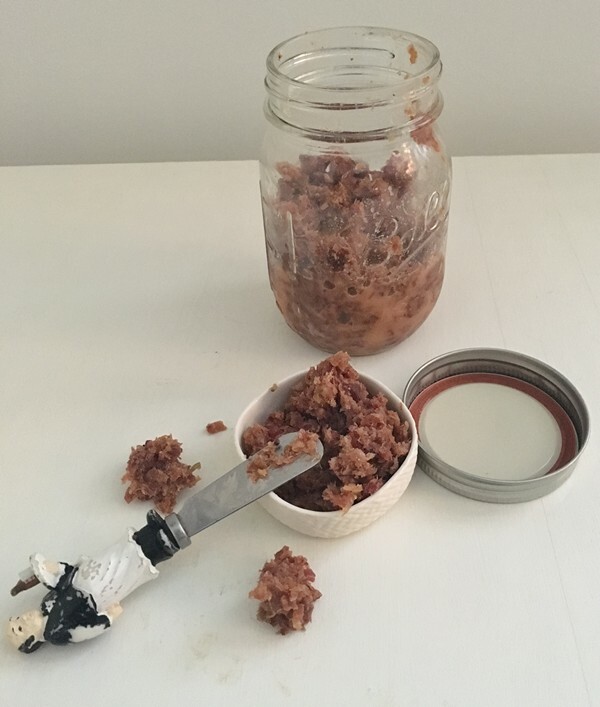 While we all know that everything * is better with bacon, some things just make you beg for more – bacon jam is one of those things. 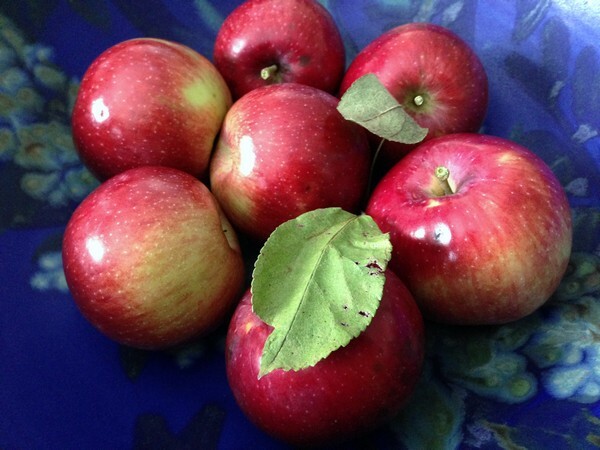 The Accidental Locavore isn’t sure where she first had it, but it was really, really good. And I had a whole bunch of lardons from recent batches of bacon. This, from Ottolenghi, makes about a pint jar. You’ll run everything through a blender or food processor so don’t worry about being too neat with the pieces. 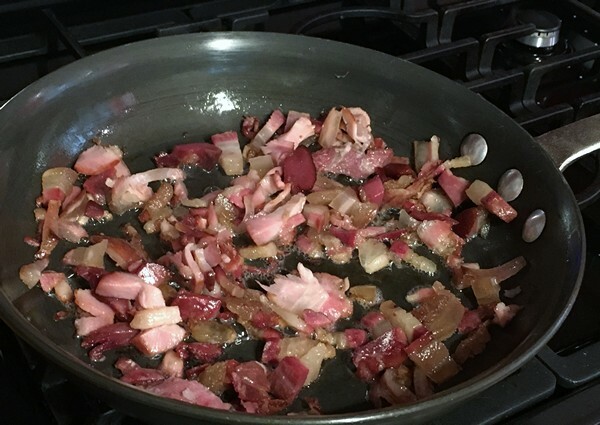 Cook the bacon in a large sauté pan over medium-high heat, until golden brown and starting to crisp, about 12 minutes. Transfer to a small bowl, keeping a tablespoon of fat in the pan (if there’s not enough fat, add some olive oil). Fry the shallots, garlic and spices for a minute, then add the bourbon, maple syrup and mustard. Leave to reduce for a minute, turn the heat to low and add the vinegar, sugar and bacon. Cook, stirring for a minute, until the liquid is thick and coating the bacon. Put all the contents of the pan into a small food processor or blender (better) and process to a rough paste. Store in a glass jar in the fridge or serve and enjoy! My verdict: What’s not to like? Try it on a grilled cheese sandwich, hamburger, scrambled eggs, crackers with goat cheese, etc. Comment and let me know what you use it on. *except for bacon swizzle sticks plunged into cold Bloody Marys and bacon/chocolate bars. 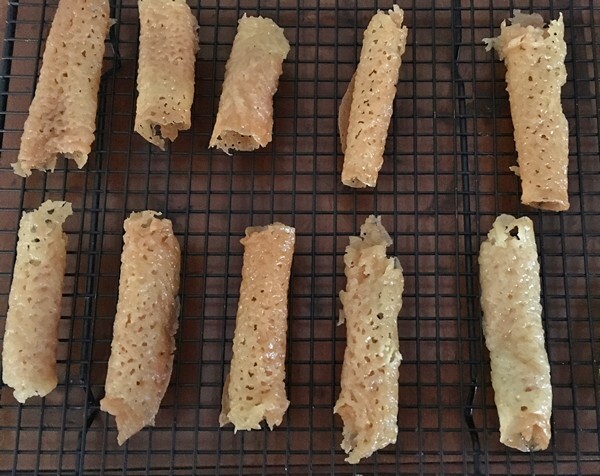 As the Accidental Locavore promised last week, here’s the recipe for the tuiles that went with the salted caramel chocolate mousse. 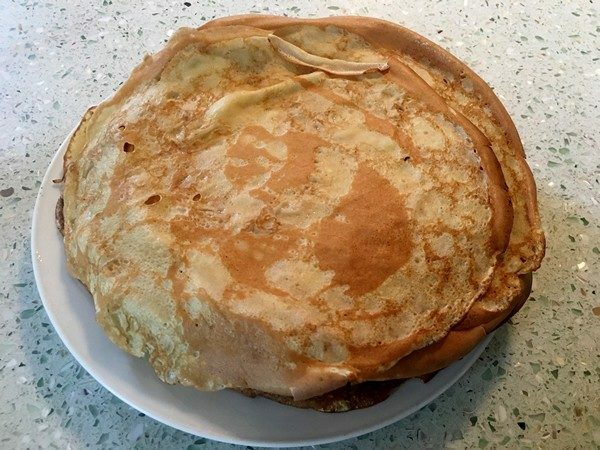 Tuiles are really easy to make, and even easier if you have a Silpat. Both make about a dozen. 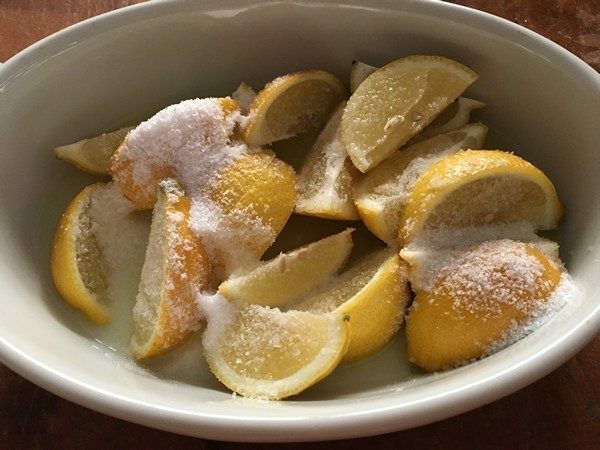 Mix the flour and salt together in a bowl. In a pot over medium heat, melt the butter then stir in the sugar, syrup and water. Continue to stir until it comes to a boil. Remove from heat and let stand for 2 minutes. Stir in the flours mixture until smooth. Spoon onto a baking sheet lined with a Silpat or parchment paper. Make sure to leave plenty of room around them, they’ll spread. Bake for 7-10 minutes until they’re golden brown. Remove from the oven and allow to cool for about a minute before shaping them. If you want to make tubes, you may use your fingers to do this or lightly butter the handle of a wooden spoon and roll them around that. If you want to make small dishes, drape them over a small bowl or ramekin. Set on a rack to cool. You have more time to work them than you might think but if they get too stuff to roll, place them back in the oven for half a minute or so and they will soften again. Preheat the oven to 350° (Do not use convection!). On a baking sheet lined with a Silpat or parchment paper, drop the cheese into small, cookie-sized piles. 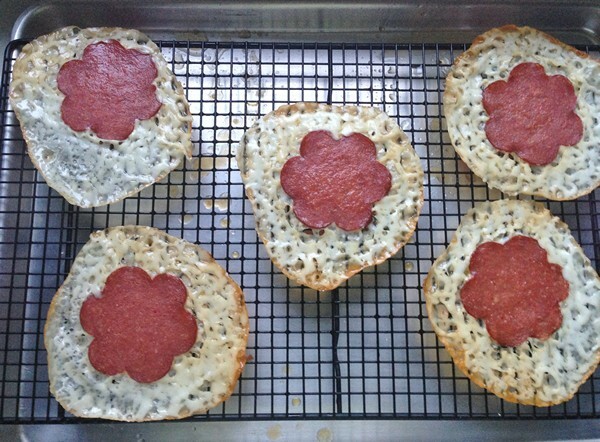 Bake until the cheese is melts and forms lacy disks, about 5 minutes. Remove from the oven, let cool a minute and shape like the sweet version above. Cool on a rack. Serve and enjoy! My verdict: Sweet or savory, these are so simple but always impressive! The caramel ones added exactly the crunch I wanted with the chocolate mousse. If they look square in the photo it’s because I didn’t space them far enough apart and they needed to be coaxed into shapes. Lesson learned. The savory ones (otherwise known as fricos) are even easier to make and are great in things like Caesar Salad. I’m not sure about the caramel ones, but you can make the savory ones one at a time in a small frying pan. 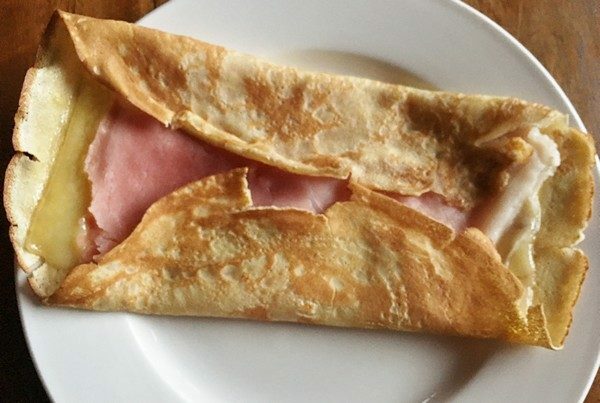 We’ve even tried embedding things like a slice of salami in them – less than successful.